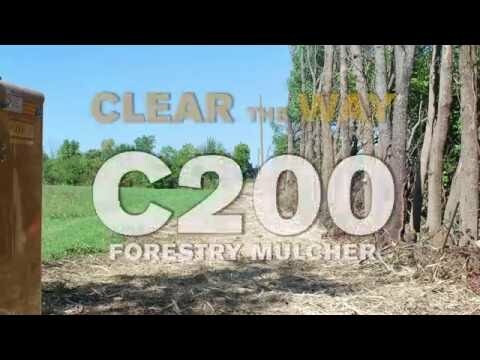 C200 Forestry Mulcher | Forestry Machines | Ohio | Rayco Mfg. 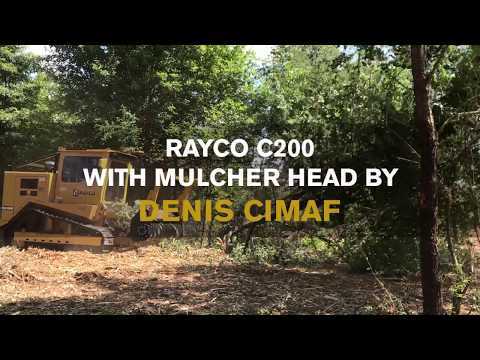 For the ultimate in compact, powerful mulchers, look no further than Rayco’s C200. The C200 is powered by a 200hp Isuzu diesel and tips the scales at only 18,500lbs. Due to its size and weight, the C200 can be transported to and from the job easily. Its narrow profile makes the C200 the ultimate for ROW clearing on narrow lines as well as for use in larger scale clearing projects. The C200 rides on a hi-track, steel undercarriage available with 2-speed travel and is available with 20” single-grouser tracks for extreme traction or triple-grouser street pads for applications that require minimal soil disturbance. The hi-track undercarriage promotes longer track life, reduces debris packing in the track chain, and cleans easily to save maintenance time. Because it’s purpose-built, the C200 is loaded with features operators appreciate. Loader-style lift arms provide a mulcher lift height of 8-ft, making it easier for mulching taller vegetation. The operator cabin is comfortable and spacious, with a high-backed, heated seat with air-ride suspension. The rear fan is auto-reversing, reducing maintenance time. All gauges and controls are located on a large LCD display that includes a rearview camera.